COME HAVE A DRINK AND JOIN THE CONVERSATION! Every month people who work in the environmental or sustainability field meet up at informal sessions known as Green Drinks. Our Green Drinks chapter is part of the International Green Drinks network – active in over 500 cities around the world. 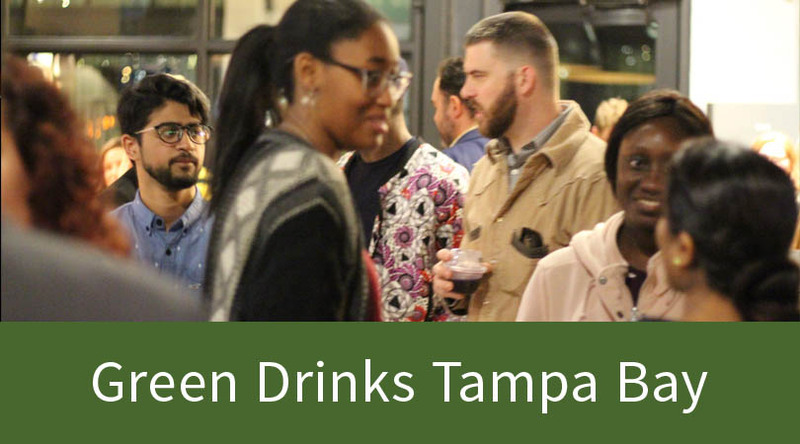 Green Drinks Tampa Bay, sponsored by the Sustany Foundation, is a great way to connect with individuals interested in the environment and sustainability in a fun and casual environment. We have a lively mixture of like-minded people from NGOs, academia, government and business and everyone is welcome. Everyone invites someone else along, so there’s always a different crowd, making Green Drinks an organic, self-organizing network. While the events are simple and unstructured, many are organized around a central theme or table topic and have invited subject matter experts. This helps get the conversations going and offers the opportunity for all guests to learn about a topic and engage in meaningful dialogue. But, it’s also a chance to catch up with friends, meet new contacts, make deals or just have a moment of serendipity. And if you want to change the world…it’s okay with us! Green Drinks Tampa Bay is hosted at a variety of local breweries in the Tampa Bay area. All are welcome. Hope to see you there soon! February 13, 2019 | 5:30pm – 8:30pm | Coppertail Brewing Co. | See photos here. January 16, 2019 | 7pm – 9pm | Tampa Armature Works/Heights Public Market | See photos here. Our inaugural Green Drinks event coincided with the 10th-anniversary celebration of the Sustainable Business Awards. See photos here.